Home > Bank > [Citibank ATM] Get your hands on the new Sony Xperia™ XZ Premium. [Citibank ATM] Get your hands on the new Sony Xperia™ XZ Premium. Get your hands on the new Sony Xperia™ XZ Premium. 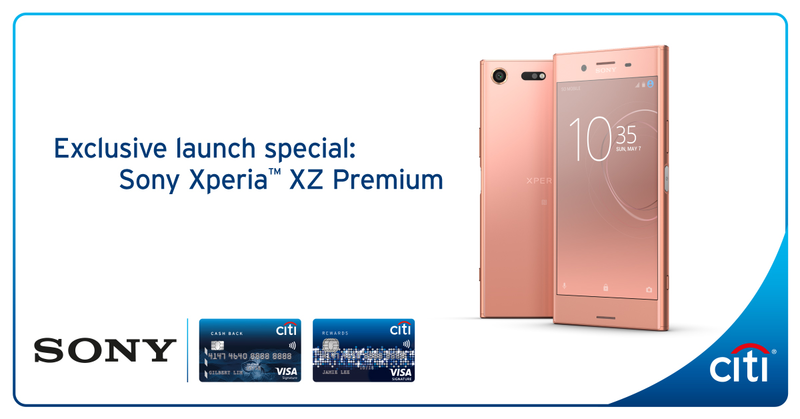 Citi Cards exclusive: Purchase a Sony Xperia™ XZ Premium (Bronze Pink) and receive a free ORBIS Cleanse & Glow Set (worth S$120) + MDR-EX150AP headphones in Pink (worth S$49). The link below leads to a third party site. By clicking on the third party link, you acknowledge that you are entering a third party site and that Citibank Singapore Limited will not be responsible for any information you provide or receive at such third party site. Apply Citibank Credit Card online now! Next: [BabySpa] Heartiest congratulations to Candyce Ang for winning an elephant spray slide!